Italian Marble Hexagon Mosaic Fireplace. 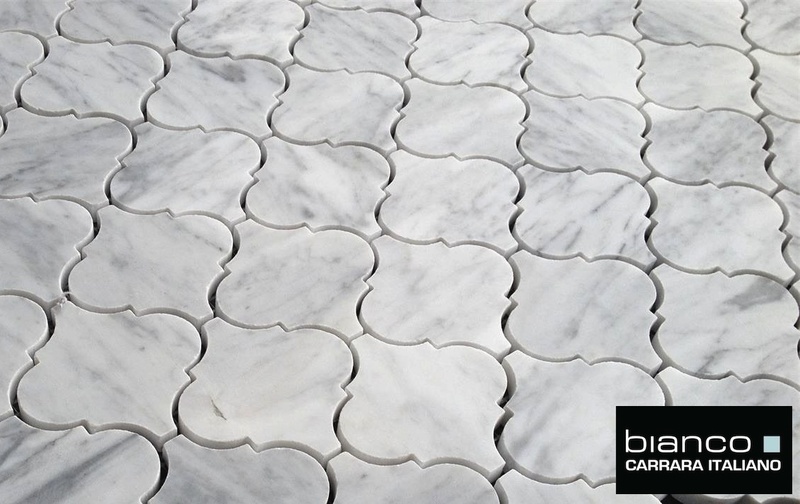 Bianco Carrara 3″ Hexagon Honed from The Builder Depot for $11.75 a sheet. 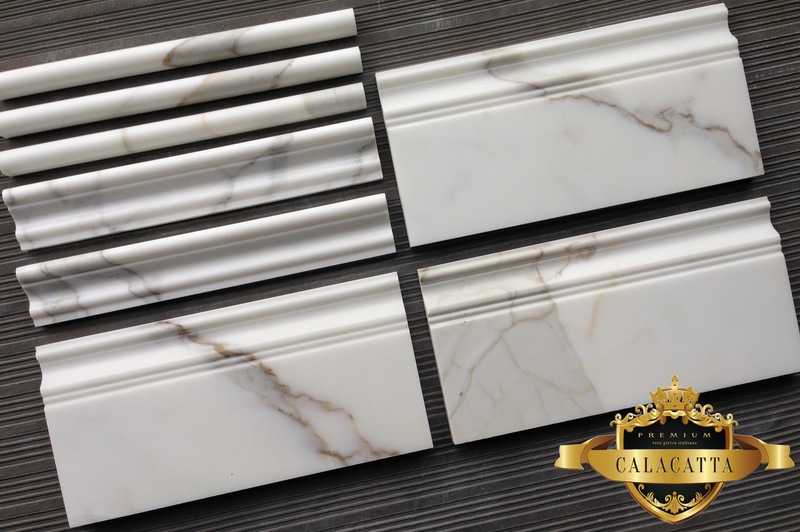 Incredible lot of Calacatta trims arrived this month. This picture shows Baseboard 6×12″ Honed • Chair Rail Honed • Pencil Trim Honed this lot# 052014cbh is now in stock. 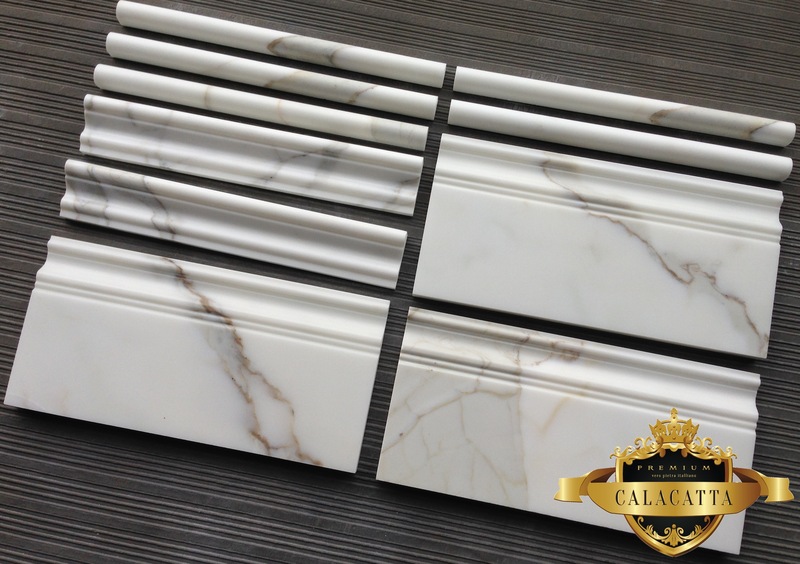 If you are interested in this particular Calacatta lot please let us know. If you are matching to existing Calacatta tile you have purchased from another supplier then please really let us know before you buy as matching up to someone else’s stone is not easy and we should work together on that to ensure a good match. We think this is a Brilliant improvement. A significantly lower price than two years ago. In fact we thought it was such a brilliant improvement that there was only one name we could think of for the collection. “Brilliant Glass“. So here are two of the products in gray shades. This collection will be a very subtle collection, soft colors. A product that can be used in conjunction with Carrara marble. Like this spectacular bathroom with light Gray glass tile I think a smoke gray would work as it is the lightest gray on the spectrum we offer (we would like to offer one more so from white to Light gray, Smoke gray, Ocean Gray and the Charcoal Gray). 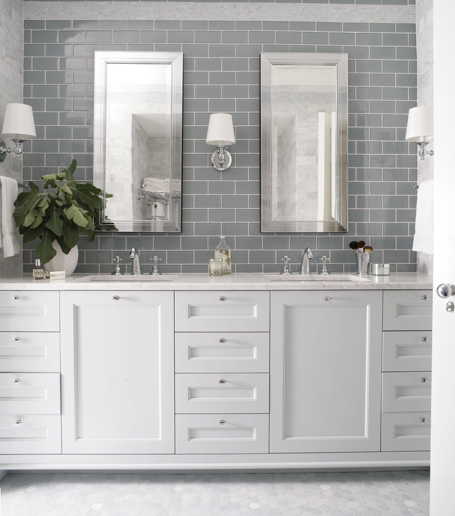 Glass Subway Tiles on the wall and Carrara 2″ Hexagon on the floor, just Brilliant. 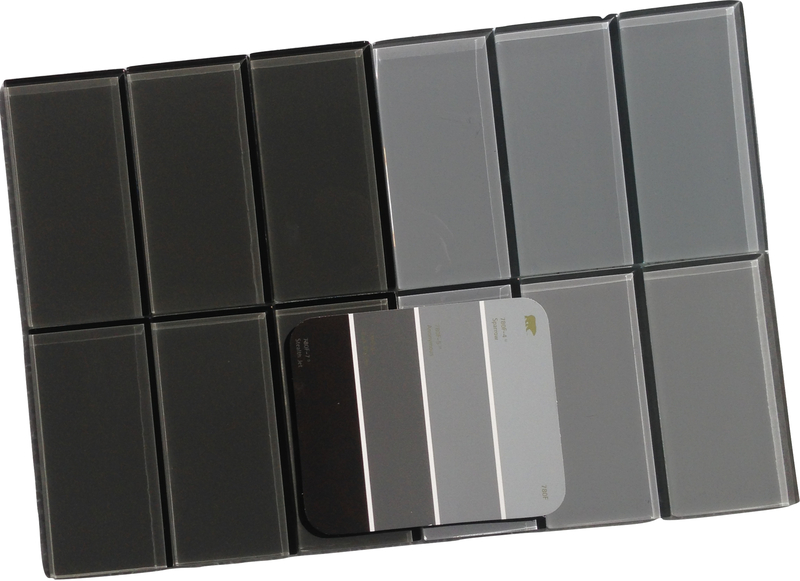 Brilliant Glass Tiles from The Builder Depot. This customer really was great sending pictures before the project really got going. AFTER: The customer ordered 65 Square Feet of Ocean Gray 3×6″ for $9.95SF and Free Shipping in 2015 (this price is valid throughout this year). This blog will be up for years. So prices no doubt will change. 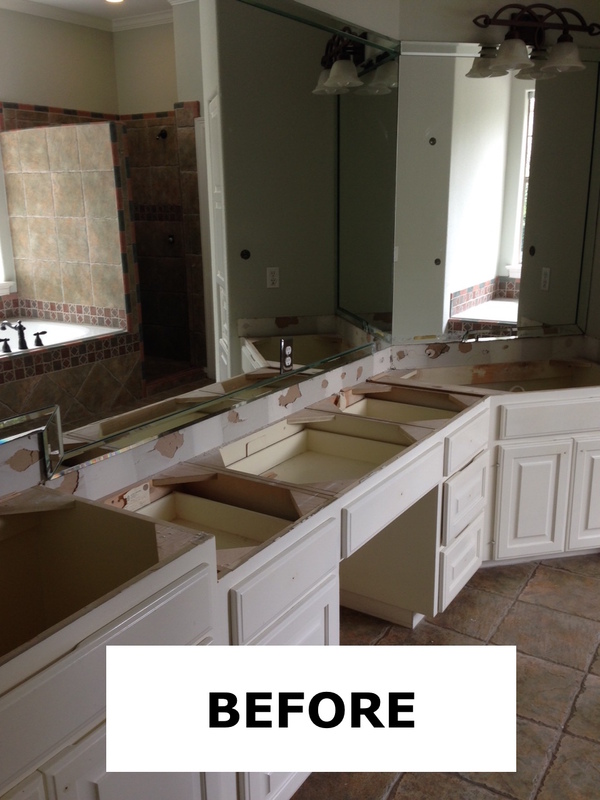 What an amazing transformation. We are so grateful for anyone sharing. We are not aiming to be millionaires just a growing group of people trying to provide the best quality look after our families and give back to the community. Simple. 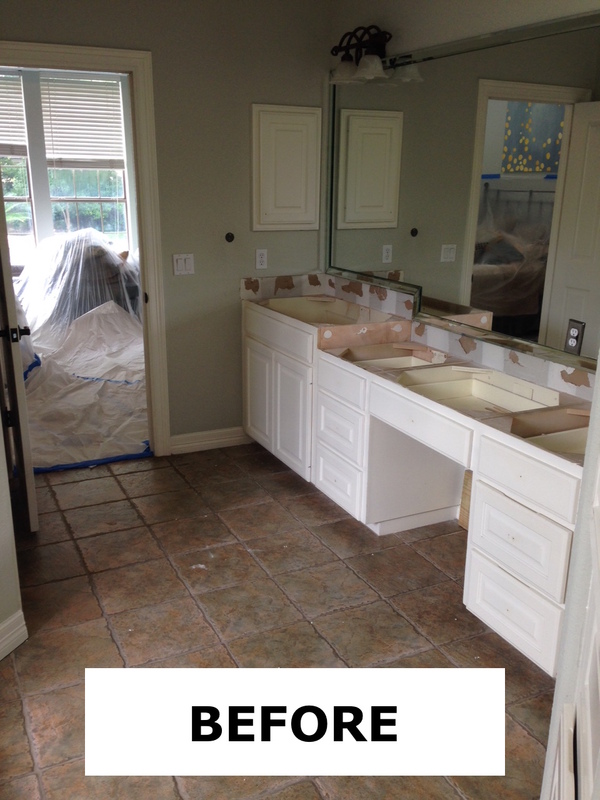 Why the minimum order on Porcelain Tile? #1. Freight LTL. This is product placed on a pallet, collected at our loading dock and loaded with a pallet truck onto the UPS freight truck. It takes that truck to the local Atlanta Terminal and then splits up shipments sending them on another truck to a local terminal near you. Then that local terminal will call to make an appointment for delivery on another truck with a lift-gate. #1. The rationale for the 40 Square Feet (SF) minimum order: In short we need weight to stop the drivers picking up your order by hand and damaging it, shippers will pick up lighter shipments (the drivers) and squeeze them between other shipments, if there is a gap, if there is not a gap, they will still try and stand it up on an edge and then just let it fall back down with a crash (once the supporting shipment is pulled out). We know this, we have seen this with other peoples shipments, we ask then not to, please be careful with the products not just ours but everyones. But they are tired of traffic, hot and can be having a bad day. Let’s say 20SF ships LTL Freight, it would weigh 110Lbs, the driver can pick it up, he will want to move it out of his way to create more space so he can get other shipments off quicker. If your order is between two shipments and they shift, the top (your product is exposed) to the other two shipments and they will squash it, smashing into it. The pallet has wood all around the edge with the product is in the middle, the wooden pallet not only acts as a support but as a buffer, the product does not hang over the edge. It is designed to ship flat, the pallet protects it from the pallet truck, other shipments and the side of the UPS truck. They cannot stack on it. It is not designed to be lifted and stuck on it’s side. At 40SF we are getting over 170Ls, maybe close to 200Lbs with the weight of the pallet. The driver is not going to enjoying lifting this, he cannot move it easily, it will not slide. The percentage risk drops significantly of the driver moving it or even attempting it. Also in transit it will not shift. The drivers scan down the shipments they carry looking for the light ones. #2. Ground Shipments; this is not even slightly possible. Porcelain by nature is fragile and ground shippers see “Fragile Handle with Care” as a suggestion, in addition the conveyor belts the companies use have drops and knock around the shipments. The product will snap, chip and break. I know you want less than 40SF and the product is really nice. 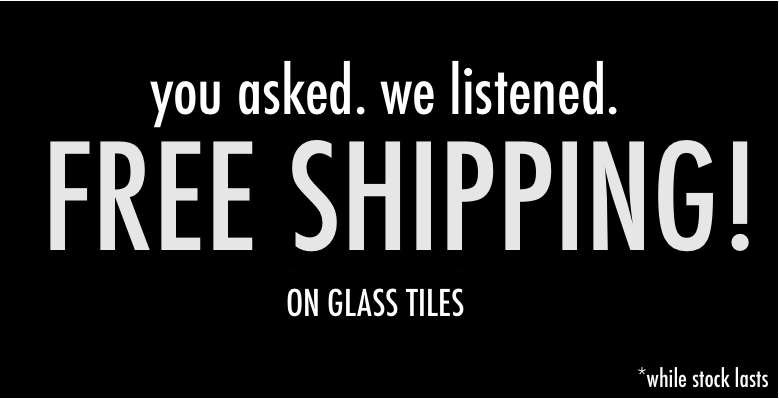 We have priced it at a point where we can have no more than 5% damage or chips during transit (as a chipped tile can be used as a cut end piece – this is acceptable as stated in our shipping and damage policy). We have not priced our products for 50-60% damage, whereby we would have to keep re-shipping more and more UPS ground to replace the damage. This would simply increase the cost of the product, UPS or FedEx will not pay the claims and if we have to hire people to have a “claims department” then we have just increased the product cost and something is wrong. That is not what we want. Not what you want! We are able to sell at these prices because of this very reason. The margins are very low. We price it so that when we ship it, it arrives intact (within 5%) and the customer is happy. Prices go up when companies have to keep re-shipping. This business model does not work for everyone, perhaps 70% of customers. We apologize to the 30% that it does not fit – the customers that need smaller orders. But all we can do is control the quality of the product. We do not control the shipper. But with weight in the shipment we can ensure they are limited on how much it can move or be moved. That dramatically increases the likelihood of a perfect shipment. 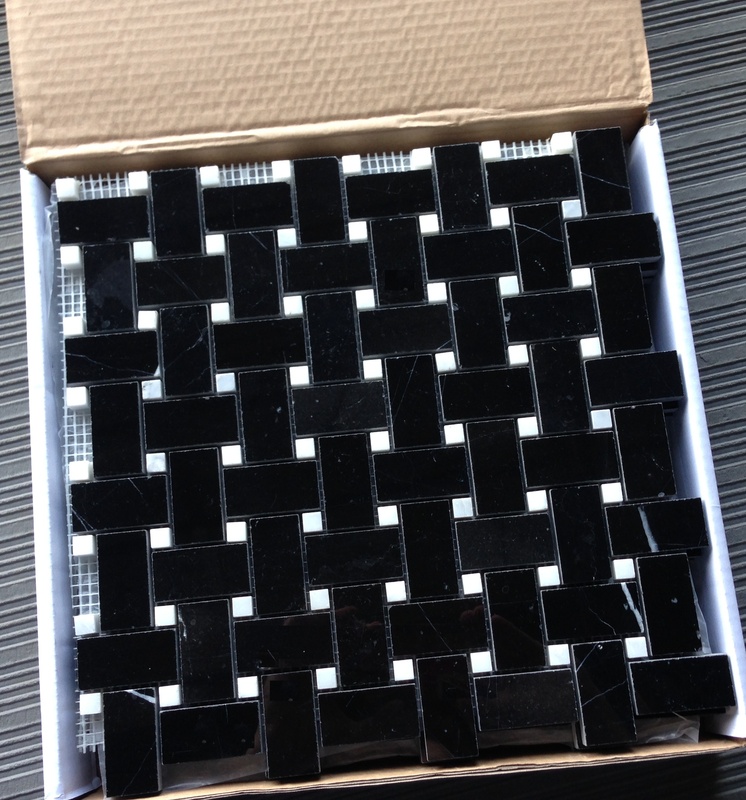 In time we hope to have another website or option where we will be able to bubble wrap each sheet of mosaic. So people can order just 20SF and after lots of testing be confident it can survive shipping from GA to WA without damage greater than 5%. That would of course be a different business model and the product price; for example of a Dove Gray for $11.25SF would become $16.75SF to pay for the additional labor and packaging materials. Ultimately anything can be done but it comes down to cost. We have just priced everything to the lowest point aiming at the markets largest segment. Please note minimum orders do not count for local pick-ups.